Tricia's Take: OOTD- Stretchy dresses can be a girl's best friend! OOTD- Stretchy dresses can be a girl's best friend! Did I tell you I believe in love at first sight? Well I do and I found it with this! I am trying to justify getting it since this top arrived and I am totally mid-drifting in it!! FYI it's not an attractive look for anyone but especially not a pregnant woman! It's like a dressed down version of the Felted Lei which is one of my very favorite cardigans EVER!!! 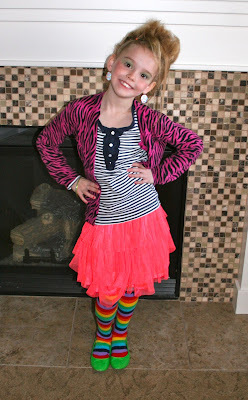 Today was "Fashion Disaster" day at school.... I really wanted to do more but she still wanted to be *pretty! * I am sure she has a crush on someone in her class! The Faux-Hawk was really fun to do but she made me tame it waaay down! You are stunning. And heck, stretchy dresses are my best friends now and I'm not pregnant! :) Your daughter looks absolutely adorable!!! YOu daughter is too freaking cute! You really don't look chubby or pregnant! You look very lovely!